Successfully navigating the corporate world, Judy Munro learned how to read people through facial expression and body language. Yet, perhaps it’s more accurate to say that her keen powers of observation as an artist served her well in this culture, one in which the truth behind appearances may be given away by the subtle turn of a mouth or the unconscious clasp of a hand. “I see a face, and I have to have it,” says this accomplished figure painter. Munro has always been interested in human physiognomy for the way faces and hands tell stories. Quick to discern the salient features of both human and physical nature, she creates expressionist character studies and landscapes with a painter’s eye and a dramatist’s sense of staging. Looking out of the canvas, the figures in her paintings seem at first glance to be stylized portraits, but the outward aspect is as much facade or personation as rendering of an individual countenance. Rather than windows of the soul, eyes are impenetrable and even sphinx-like, seeming to stare down and scrutinize the viewer. Munro accentuates the modeling of intriguing faces to the point that they seem like masks. A lover of mysteries, she defines and highlights forms only to make the figures more enigmatic — as if they are conspirators or keepers of some secret. Perhaps a vestige of her graphic design career, Munro understands the power of blocking out a composition, and her contrast of sculptural and flat areas adds to the somewhat unsettling feeling of her visual who-dun-its. A few emphatically drawn props become clues to some hidden meaning or puzzle, with the question to be answered remaining elusive and for the viewer to determine. In some instances, the interaction of the figures with these ordinary items is reminiscent of genre paintings. 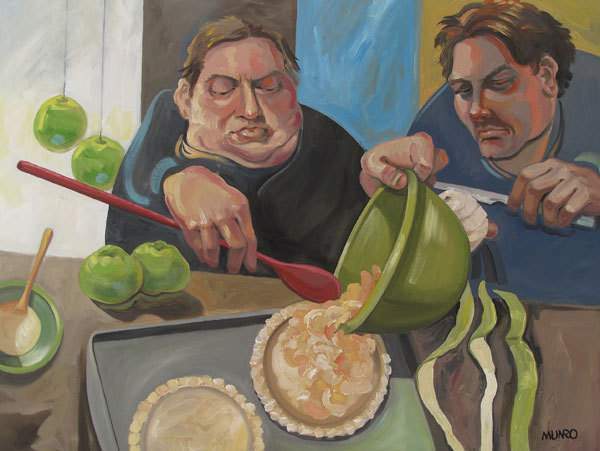 Yet Munro gives these scenes her own nonsensical twists made even more quirky with amusing titles: a nun sews orange rinds in Fruit Mender; thickset men fill crusts with apples in a work titled Guys Making Pies. Admiring the art of Flemish painter Pieter Breughel the Elder, she shares his interest in the folly of mankind, but her depictions come from her imagination and not from shared tradition. With a view on life that relishes the “compellingly absurd,” Munro favors skewed perspectives and confrontational compositions that are in keeping with modernist masters. This imparts a sense of topsy-turvy, in contrast to the restraint of the dramatis personae. Unlike the rollicking scenes of Breughel, her psychological insight aligns with artists like Toulouse-Lautrec or Max Beckmann, who observed the tragicomedy inherent in the role-playing of contemporary life. 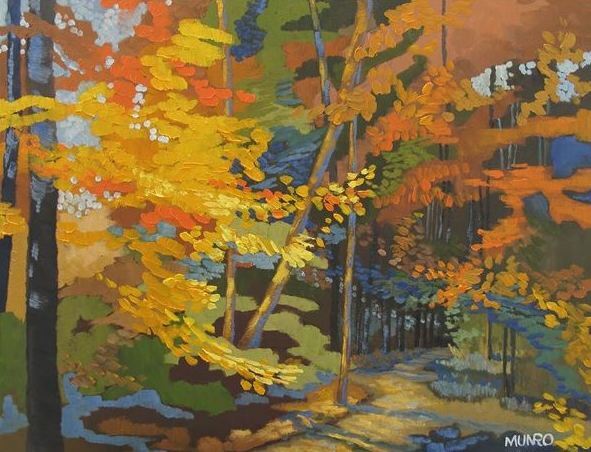 Working more swiftly than in the figure paintings, Munro lays down her paints alla prima with such panache as to capture the invigorating effect of nature. Some of Munro’s landscapes are so vividly naturalistic that you can hear a loon’s cry. In others, the artist embellishes the color and intensifies perceived patterns, which evokes a heightened sensory or emotional effect. Within tree-filled spaces, trunks run from the bottom to the top of the canvases, implying the sheltering canopy above. Gathered in rhythmic arrays, these sharply drawn bands composed of sinuous contours provide both structure and spatial complexity, with some arranged on the surface picture plane and others staggered throughout. Interpenetrating grasses, bushes, and leaves add soft contrast, as do shifts in tonality that suggest varying light. 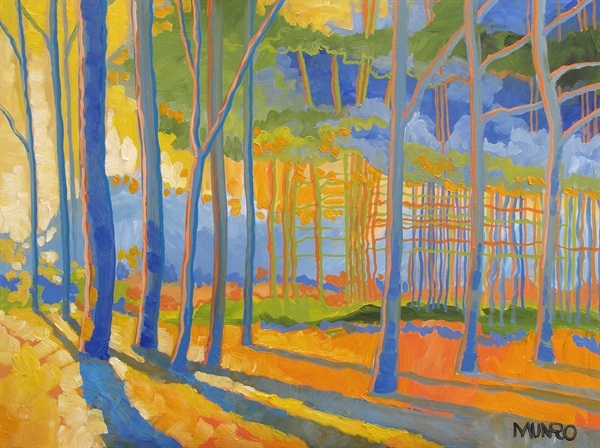 Using complementary colors of blue and orange, Munro creates a visual snap as well as counterpoint of cool and warm sensations — like simultaneously feeling the chilly damp of the forest floor and the heat of the sun as it filters through the branches above. Rather than the disconnect of being alone, these landscapes offer the immersion and richness of solitude in which one can get in touch.